Science has demonstrated specific colors can affect human performance. This phenomenon is seen across cultures and sexes. Pink and red seem to elicit the strongest responses. These colors have been tested in various arenas including labs, weight rooms, playing fields, the Olympics and of course advertising. The data, as usual, is inconclusive but does seem to demonstrate a statistically significant effect on human behavior. Baker-Miller Pink aka Drunk Tank Pink (I’ll get to that later) is known to act as human Kryptonite. This color calms and weakens people who are exposed to it. The effect lasts 15-30 minutes with longer exposures having the opposite effect of increased violence. You might think this is just a simple social environmental bias against the color pink. That theory doesn’t pan out because (and this is where it gets weird) the calming physiological effects have been noted in color blind individuals too. Don’t stare at this too long or you might lose your superpowers! Drunk Tank Pink got this nickname in the late 70’s after a psychiatric study asked 150 men to look at a pink or blue board then take an isometric strength test. Those who stared at the blue apparently amplified their own strength by doing so, while the others seemed weakened by gazing at pink. Beyond a person’s socio-environmental linkages no one knows why this happens. The color’s power to mitigate strength is not limited to men. In 1980 the Journal of Orthomolecular Psychiatry published a paper which observed a significant decline of muscle strength in both men and women. 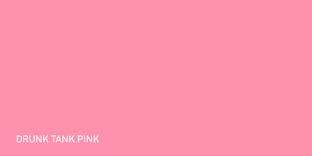 With this new research in hand, pink’s supposed tranquilizing effect rapidly gained currency among psychologists. Two forward thinking corrections officers, Gene Baker and Ron Miller, painted holding cells in their respective facilities a hot-pink shade, reported an immediate subduing effect and voila: Baker-Miller Pink, aka Drunk Tank Pink, became the prison industry’s latest innovation. The legendary Iowa football coach, Hayden Fry took this new information to the nth degree. He ordered the visiting team’s locker-room at Iowa’s Kinnick Stadium be painted Drunk Tank Pink in order to give his team the advantage from the get go. Some teams were so bothered by this that they covered the walls with newspaper before the players went into the locker-room. Despite protests and numerous legal battles, the locker-room remains pink today. Before you go out and paint your rival’s house pink you should know the research is anything but conclusive. Then again who knows, it just might give you the edge you need! There have been many studies looking at the effect color has on athletic performance. Perhaps the most promising athletic booster may be the color red. Psychologists believe humans are more attuned to see red as a sign of danger. 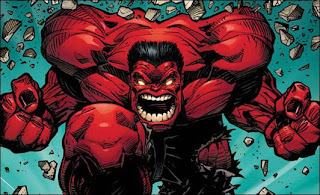 Think of blood or the reddening of an enemy’s face when he gets mad: I’m so angry I see red! This color seems to evoke the fight or flight response and an increase in respiration, strength, and awareness. Unfortunately, the story gets a little fuzzier so don’t go out and buy a bunch of red workout gear just yet. It seems that referees and umpires are more likely to side with the player wearing red than any other color. In other words, the red adorned athlete may not be better, the judges just perceive him as the superior competitor. Moreover, it seems likely the color red triggers an unconscious fear in one’s opponent. In the wild, primates exhibiting the reddest coloring (on the chest or face) when facing an opponent will exude dominance and usually get his challenger to back down. Does it seem like a stretch to attribute this unconscious effect on wild primates to their bigger brained hairless cousins, Homo sapiens sapiens? It won’t hurt to wear the color red at your next sporting event and if you get your opponent to wear Drunk Tank Pink all the better. This entry was posted in baker-miller pink and weakness, color and strength, drunk tank pink, exercise, red uniforms, sports and colors, strength and colors, strongest colors, the color red and strength and tagged baker-miller pink and weakness, color and strength, drunk tank pink, exercise, red uniforms, sports and colors, strength and colors, strongest colors, the color red and strength on May 30, 2013 by Doug.